Our pick for the best juicer in the market is the Tribest GSE-5000, a cold press. We admire its slow speed, minimal oxidation, ease of cleaning and assembly, its sheer versatility, and the impressive 12-year warranty. The step-up pick is the Kuvings NJE-358OU, also a cold press juicer. It has a unique masticating technology that ensures maximum nutritional value is extracted from your fruits or produce. Also attractive is the quiet operation, the reliable motor, the auto-feeding design, and the versatility provided by its 7 different nozzles. For the budget pick, we chose the Omega J8006, owing to stunning features like its low RPM, high juice yield, auto pulp-ejection mechanism, quiet operation, lack of clogging and heat build-up, powerful motor, and a warranty that lasts an astounding 15 years. Nowadays almost everyone is “juicing”. Due to the unhealthy lifestyles we have been leading, pumping our bodies with junk food and sugary drinks, we the twenty first century dwellers are prone to a variety of lifestyle diseases such as diabetes, hypertension, obesity, high blood pressure, high cholesterol, heart disease, stroke, and so forth. To counter this bad trend, juicing is one of the healthy practices many have adopted and adapted into their regular schedules. An apple a day keeps the doctor at bay – but what if you juiced the apple and drank it on the go? You see, juicing is a great way for busy people to keep healthy and increase their nutrient intake without losing any precious time. The great thing about juicing is that you don’t have to restrict yourself to fruits. A good, strong, versatile juicer will also do leafy green vegetables, herbs, grasses, and sprouts, and can even make nut milk. Most people can’t tell the difference between a juicer and a blender, and imagine that they are one and the same machine. They aren’t. The juicing process involves the extraction of water and nutrients from produce, and the subsequent disposal of the indigestible fiber (the pulp) that remains after the juice has been squeezed out of the pieces of produce. Since all or most of the fiber has been taken out, there is less work for your digestive system to do in breaking down the food. As such, the nutrients are now more readily available for absorption into your body as compared to eating the fruits or veggies whole. If your digestive system is sensitive, or if you have a condition that prevents your body from processing fiber, juicing is a great option. The fiber in vegetables slows down the digestive process, so that nutrients are released into the bloodstream at a slower, steadier pace. Juicing, on the other hand, is an almost instantaneous injection of nutrients into your bloodstream. Most body-healing and detoxification programs include freshly squeezed vegetable juices as part of their transformative diets. The rich nutrient content of juices helps to nourish and restore the body at the cellular level. Cautionary note: as we have explained, removing fiber from produce causes liquid juice to be absorbed quicker into your bloodstream. That’s okay; but if you are only juicing fruits, there might be a significant spike in blood sugar. Unstable blood sugar levels can cause mood swings, energy loss, and memory problems. Juicing should, therefore, never be taken as a replacement for ordinary diet, but rather as a complement. Fiber is filling, and if it is absent from your diet, you get hungry again rather quickly. So don’t go overboard with the juicing. Blended smoothies are the opposite of juice. Whereas juice does not contain fiber, smoothies comprise the entire fruit or vegetable, including the skin and the fiber. The blending process does, however, break down the fiber to make the veggies easier to digest. The breakdown of fiber (as opposed to removal as in the juicer) allows nutrients to be released slowly into the bloodstream, therefore preventing the risk of blood sugar spikes. Smoothies are more filling than juices. And they are faster to make. Centrifugal juicers are relatively cheap. If you are new to juicing and working with a low budget, certainly do purchase a centrifugal juicer. It’s far preferable to the alternative of not juicing at all. But if you are looking for something that gives you value for your money, consider digging deeper into your pockets and procuring a cold press for your home, office, or business establishment. 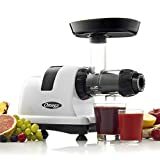 A centrifugal juicer extracts juice from fruits and vegetables by pulverizing them against a round cutting blade as it spins rapidly against a metal strainer. The spinning motion generates a centrifugal force which separates the juice from the pulp. 1. Due to the rapid spinning (as high as 12000 RPM in some cases), centrifugal juicers guarantee faster juicing time than masticating juicers. 2. They are cheap (some costing as low as $40). 3. They are easy to use. 4. Many of them accept larger fruit and veggie pieces – which reduces the time you have to spend prepping. 1. They produce a wet pulp – which means a lower juice yield. 2. The fast spinning of the blades generates a lot of heat, causing oxidation which leads to destruction of beneficial enzymes – which means a less nutritious juice. This is the main reason most juicing enthusiasts prefer the masticating juicer. 3. There is higher juice separation and foaming than in masticating juicers. 4. Due to the grinding and cutting action (to say nothing of the high RPM), they have a rather noisy operation, which is not conducive for some environments – for instance, if you want to buy a juicer for your office. Cold press juicers operate at a slower, quieter pace, gently compressing fruits and veggies to “squeeze” the juice out of them. They will cost you a pretty penny, but it’s worth it, especially since you will be getting a much more nutritious juice yield than if you bought a centrifugal juicer. 1. Proficient at juicing grasses, leafy greens, herbs, and sprouts as well as fruits. 2. They give a higher juice yield. 3. Due to the lower speeds, less heat is generated. Less heat means less oxidation, which means more nutrients and enzymes are preserved in the resulting juice. In other words, you get a higher nutritional value from your juice if you use a cold press than if you are using a centrifugal. 3. Juice separation and foaming is kept at a minimum. 4. It operates quietly, making it the best juicer for environments that require minimal intrusion, your office for instance. 5. Some of the pricier models offer multiple food processing functions in addition to juicing fruits and veggies. You can make nut milk, sorbet, pasta, ice cream, nut butter, and so forth. 1. They are pricier than centrifugal juicers. 2. The juice will have a slightly higher pulp content. 3. Food preparation time is longer since their narrow chutes cannot accommodate larger food pieces. Go for the machine which yields the most juice. As we noted, centrifugal juicers give a lower juice yield. If you can afford it, get a cold press juicer instead. The lower the speed, the better. Lower juicing speed generates lower heat levels which results in minimal oxidation levels. As a result, there is less destruction of nutrients, giving you a more nutritious drink. The lower the noise level, the better, especially if you are using your juicer in noise-wary environments like the office. Again, cold press juicing machines excel over centrifugal juicers. The latter are noisy. It is the rapid spinning rate (as high as 15000 RPM) of the cutting blade that creates this racket. Choose a juicer that can juice both hard and soft produce; not only fruits, but also greens, herbs, grasses, and so forth. If you get one that can make nut milk, sorbet, ice cream, nut butter, and pasta, that’s a bonus. We have already looked at the reasons why masticating juicers are superior to centrifugal juicers; mainly because they provide higher nutritional value. Because of this, this list of the ten best juicers will be dominated by cold press juicers. As we earlier established, the appeal of juicing is its ability to save precious time for the ever-on-the-go twenty first century go-getter. But what would be the use of saving that time only to lose it struggling to clean your appliance? The best juicers are relatively easy to clean and easy to assemble. The dishwasher environment is one of high temperatures and powerful detergents. If your appliance is made of parts that aren’t dishwasher-safe, these parts will suffer damage or lessen in durability. Are the materials which have been used to build the appliance BPA-free? BPA, an industrial chemical used in many plastics, is potentially hazardous to young children and pets. Responsible companies only use BPA-free materials to manufacture their products. From our research and tests, we consider the Tribest GSE-5000 to be the best juicer. We based this judgment on a variety of factors. As you might expect from what we have already told you about the best juicers, the GSE-5000 is a cold press. Its stainless-steel, bio-ceramic, magnetic technology enables this masticating juicer to extract nutrient-rich juice from produce. The slow speed of 110 RPM is conducive for juice extraction, since there is minimal oxidation, ensuring you get a high-quality juice at the end of your juicing session. Due to its modern, sleek design which has fewer parts, the juicer is easy to assemble. And it won’t require rocket science for you to figure out how to start using it. For easier cleaning, the juicer comes with cleaning brushes and a scraper tool. We also loved the versatility of the GSE-5000. Thanks to its homogenizing accessories, you can convert it into a food processor and homogenizer. Want to make nut butters, salsas, frozen sorbet, or pasta noodles? Go ahead. But what turned us into disciples was the amazing 12-year warranty. And what’s more – there is a dedicated customer service team that is available to help you with any queries you may have concerning your juicer. It might take you quite a bit of time to clean up. But that’s not a deal breaker, considering the value you get from the juicer. It’s also rather pricey, although it’s totally worth it. The Kuvings NJE-3580U is not as expensive as our pick for the best juicer, but it is almost as excellent. The masticating technology, for one, guarantees you a minimally oxidized juice rich in enzymes and other beneficial nutrients. Some of you like noisy appliances. Most people don’t. When you are using your appliance in a shared space, people will frown on your rudeness if you turn up with a loud juicer. Operating at a slow speed of 80 RPM, the NJE-3580U is a quiet beast that will give you great value without causing a nuisance to those around you. These days convenience is the name of the game, and businesses are competing to provide as much convenience to their customers as possible. With 7 different nozzles for food processing, this product ensures you have nothing to complain about, since you can do a lot of things with this machine. Not just juicing, but also mincing, grinding, crushing, extruding pasta . . . name it. Thanks to its continuous juicing system, you can juice for up to 30 minutes. This system works by automatically separating (ejecting) the pulp from the juice, enabling you to juice without interruptions. Plus, the user-friendly design makes it easy to use and clean. 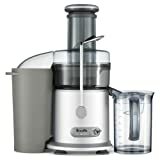 For the budget pick, we settled on another awesome masticating juicer, the Omega J8006. While you will find some machines operating at speeds as high as 15000 RPM, the J8006 works at an impressively slow 80 RPM. Don’t be put off by this slowness. True, it might take you a bit longer to get your juice, but it also means that what you get will be more nutritious because: slow speed = less heat = less oxidation = preserved integrity of enzymes and other nutrients = a glass packed full of healthy goodness. The J8006 has a dual stage juice processing system designed to extract as much juice as possible from produce. Not just fruits, but also vegetables, leafy greens, and even the infamous wheatgrass. And that’s not all: you can make nut butters out of nuts; you can make baby food using fresh, natural ingredients; you can also make soy milk, grind coffee and spices, extrude pasta, as well as mince herbs and garlic. We also loved that it’s made of GE Ultem Auger, which if you don’t know, is several times stronger than most plastics, so you are getting a sturdy, hardy, robust appliance. And we loved that it can store juice for up to 72 hours without degradation or juice separation. Loved that there is minimal frothing and foaming. And that it has an auto pulp-ejection mechanism which ensures continuous juicing. We consider the XtremepowerUS XPJ-101 to be the best for commercial use. With more and more people adopting the juicing lifestyle, it’s a wonderful time to consider putting your juicer to work and getting a return on your investment. You may be thinking of a juice bar or stand, or just as a charming addition to your coffee shop or café. While most juicing machines are targeted for home use, the XPJ-101 is appropriate for use in small drink shops, fruit shops, hotels, restaurants, bars, the office, and in tea and coffee houses. It comes packaged in a high-quality stainless steel case. It is corrosion resistant, and easy to wash, so it won’t give you any problems on that side. You can squeeze up to 22 oranges per minute! At that rate, you will be making more juice than you or your customers will know what to do with. 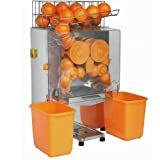 Plus it operates automatically: just wash some fresh oranges, pop them in, and this machine will automatically peel the skin, make the juice and automatically filter it. The main downside, we found, was the difficulty in getting repair parts for the machine. The Samson SB0850 is a reliable (if rather pricey) wheatgrass juice extractor. Wheatgrass is infamous for the difficulty most juicers encounter in trying to extract juice from it. That’s why getting an appliance specifically designed to handle this troublesome produce is so important. The SB0850 can process up to 5 ounces of produce per minute: a diverse range of produce like herbs, grasses, sprouts, and other greens. So if you are into the veggie diet, this is your ideal juicing machine. The SB0850 has a low speed of 70 RPM, which ensures that you get as much nutrition as possible from your wheatgrass or other produce. We did a test: making wheatgrass juice with this machine versus with a regular one. The results were gratifying. While the other machine clogged, this one worked well. A blender is also a good option for making drinkable wheatgrass, but as we said, blenders don’t take out the fiber. The SB0850 is easy to assemble, disassemble, and clean. It has forward and reverse buttons that make everything easier. And it has a continuous pulp expulsion system which helps you juice with minimal interruptions. 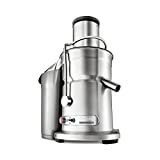 For the best centrifugal juicer, the famous Breville 800JEXL takes the top spot. Other than the affordable price (this one isn’t cheap by the way), the main advantage of going centrifugal is speed. As we established, most of us take up the juicing lifestyle because of the convenience. We simply don’t have time to sit down and peel an orange and eat it, piece by piece. Cold press juicers are extremely slow, with speeds as low as 70 RPM. The 800JEXL has two speeds: high (13000 RPM) and low (6500 RPM). At these rates, you can make your juice in a jiffy, drink it quick, and be off, or drink it on the go. 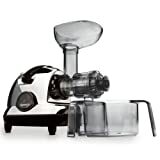 Other great features include: the 3-inch feed tube that can take up whole fruits and vegetables; the dishwasher-safe parts; the die-cast steel housing with stainless steel micromesh filter and titanium-plated cutting disk; and the safety locking arm that prevents the machine from operating if the cover is not locked into place. For an affordable quality juicer, consider another Breville product, the RM-JE98XL. Most quality juicers go for prices ranging from $250. Some cost as much as $800. If you have a low budget, there is no reason you shouldn’t get yourself a quality machine. While the very cheap ones sell for as low as $30, we think this Breville is the best in the price range below $150. A centrifugal, just like the preceding, it goes for $120. But price was not what attracted us to this particular machine. We love it for its features. For one, we can use to make juice quick to drink on the go. With two different speeds (12000 RPM and 6500 RPM), it is capable of juicing both soft and hard produce. The high speed is for the dense fruits and the harder veggies, while the low speed works best for the leafy greens and the softer fruits. The feeder chute is extra wide at 3 inches, which makes it easier to accommodate large chunks or even entire pieces of your fruits or vegetables. If you are crazy about time-saving, you will love that: you will spend less time preparing produce for juicing than you normally do. If you are struggling to figure out what juicing machine would be appropriate for your office, look for the Tribest Slowstar SW-2020. The main concern when getting an office juicer is the noise levels. You don’t want to disturb everyone’s tranquility and productivity with a loud machine. Noise levels depend mostly on the speed of the motor. As its name (Slowstar) suggests, this machine is incredibly slow. At 47 RPM, you have never seen a slower or quieter juicer. With this slow pace, you should also expect less oxidation, and hence a more nutritious drink. Another important factor is length of juicing time. Workers should make their drinks quickly and get on with their core tasks. 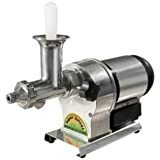 And that’s where the duo-blade auger comes into play: it makes the juicing experience faster and easier, even for beginners – so there is less time being spent making drinks or teaching people how to use the machine. The bonus benefit is that you can also make salsas, frozen sorbets, nut butters, sauces, and so forth. In interrogating what product would be most appropriate for family use, we considered three main factors: safety, versatility, and nutrition value. The Hurom H-AA slow juicer excelled in each of these factors. For one, it is BPA-free. BPA (Bisphenol A) is a chemical used in the manufacture of many plastics. It has caused great controversy with different parties pushing forward differing opinions on its alleged health risks. The FDA’s official verdict on the matter approves the current use of BPA in food containers and packaging; but it’s better to be safe than sorry. The chemical is suspected to be particularly harmful to young children and pets. So on the matter of safety, the Hurom H-AA scores an A since it is made of BPA-free parts. And it doesn’t have any sharp edges. On versatility: since it is a family appliance, you will want something that can do more than just one thing. And that’s what you get with this juicer. You can use it on fruits, veggies, leafy greens, nuts, and soybeans to make not just juice but also milk (nut) and tofu. It comes with a spinning brush which you can use to thoroughly stir and mix the different fruits and vegetables for a tastier flavor and aroma. On nutrition value: it is a masticating juicer. At a slow speed of 43 RPM (the slowest on this list), the juicer’s patented Slow Squeeze Technology squeezes out the juice with minimal oxidation, ensuring the nutrients and enzymes in the juice retain their integrity. If you are new to juicing, you probably don’t have many preconditions. All you want is a nutritious juice. So I will recommend the Breville BJE200XL, a centrifugal you can get at an affordable price. Operating at a speed of 14000 RPM, with a motor of 700 watts, the machine makes juice fast and efficiently. That will save you a lot of time. As a beginner, you might be hazy on how the machine actually works. 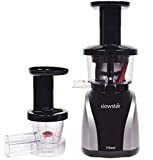 With that in mind, the makers of the BJE200XL included a safety locking arm which prevents the juicer from operating if the juicer cover is not in place in the vertical operating position. The parts are dishwasher-safe, and the appliance comes with a custom cleaning brush. Other features are: a centered knife blade assembly, heavy-grade polymer body, stainless steel cutters, stainless-steel micro-mesh filter; and a 3-inch centered feed tube. We selected the appliances in this list for their nutritional value, efficiency, quiet operation, safety, ease of use and assembly, among other features. This list is just a small representation of what we consider the very best juicers in the market. There are many products we didn’t mention which are just as good or almost as good. And then there are others which have the wrong features: they are too noisy, produce too much froth, yield too little juice, are difficult to assemble and clean, are made of weak material, and so forth. Q: Why is it important to juice? It’s an almost instantaneous way to get nutrients absorbed into your system. All it takes is about 15 minutes. Due to impaired digestion, your body may lack the ability to readily absorb nutrients from veggies. But if you drink a fresh juice, the nutrients go into your bloodstream within 15 minutes. Juicing is superior to drinking store-bought juices since the latter are low on nutrient content due to the pasteurization process. You incorporate a broader range of fruits and vegetables in your regular diet. Even things you would ordinarily not dream of eating like wheatgrass. Because of health benefits such as: increased energy, better digestion, clearer skin, higher mental clarity, and a deep sense of wellbeing. Q: You say cold-pressed juicers are better than the centrifugal. But aren’t they also more expensive? A: Sure they are. $250 for a cold press is actually a fair price. Some go for as much as $800. But consider this: a cold press extracts 35% more juice out of fresh produce than a centrifugal. Do the math. At the end of one year of juicing, you will have recouped your initial capital (relative to using a centrifugal), and saved more money. Q: How long does cold-pressed juice last? A: The type of produce matters, and b) the storage method matters. My advice: drink up as soon as possible after juicing – that way you get the maximum nutritional benefits and enjoy the taste of the juice at its best. 15 minutes after juicing, light and air begin to destroy the nutrients in the drink. If you refrigerate your freshly-prepared, cold-pressed fruit juice, it will keep for between 24 and 48 hours. Vegetable juices will keep for 12 to 24 hours. Q: How do I ensure the juice I prepare at home is safe to drink? Wash your hands for no less than 20 seconds with warm water and soap before and after you prepare the juice. Ensure you cut away any part of the fruit or vegetable that seems damaged or bruised. If the produce looks rotten, discard it. Wash the fruits or veggies in running water before you commence cutting. This includes produce you grow at home, as well as that which you have purchased from a grocery store or at a farmers market. If you are dealing with firm/hard produce like cucumbers or melons, scrub it with a clean produce brush, even if you will peel it prior to juicing. Washing the produce like this ensures that dirt and bacteria will not be transferred from the surface into the juicy part when you are peeling or cutting. After the wash, dry the produce with a clean paper towel or cloth. Doing so reduces the bacteria present on the produce’s surface. Q: Are there any advantages in drinking juice over blended smoothies? A: According to this 2014 study published in Preventive Nutrition and Food Science, drinks prepared by juicing are richer in ascorbic acid (vitamin C) than drinks prepared by blending. Apples, mandarin oranges, and pears had the highest ascorbic acid content. If your body is deficient in vitamin C, you are likely to suffer from scurvy. It’s also worth considering the findings of this 2011 study published in the Nutrition Journal: the study observed that individuals who drank 16 ounces (2 cups) of carrot juice per day for 3 months underwent a significant increase of antioxidant capacity in their blood plasma. This means that antioxidant activity had increased in their bloodstream. Q: What is a juice cleanse? Is it a good idea? A: Juice cleansing involves a fruit-and-vegetable-only diet taken in juice form. It can last for a period ranging from 3 to 10 days. Some juice cleanses last only 1 day. While a moderate juice cleanse can increase micronutrients and dietary phytochemicals, and improve plasma antioxidant status, an extreme regimen can be harmful. Due to the lack of fiber in juice, a juice-only diet will leave you feeling constantly hungry. In addition, the high sugar content in juice may cause spikes in blood sugar which could lead to your red blood cells stiffening, which interferes with blood circulation, and can result in a buildup of cholesterol in your blood vessels over time. You should also remember that fruits and vegetables generally contain very little or no protein. If you don’t include animal meat, legumes, or dairy products in your diet, you will fail to meet the recommended daily allowance of approximately 56g of protein a day for a man and 46g for women. One day won’t hurt, but multiple days on a juice cleanse will lead to protein deficiency. To increase your protein intake, you can include nut milk in your juice cleanse; but that’s still not enough to meet the recommended daily allowance. Besides, nuts are not a complete protein source, since they lack some essential amino acid building blocks that your body needs. The absence of certain nutrients in their diet could explain why some juice cleanse practitioners report experience fatigue and headaches. Q: Will juicing help me lose weight? A: A tentative “yes”. Temporarily. Since most juice diets exclude solid food, there is a large calorie deficit. This may lead to weight loss in the short-term. But once your calorie intake returns to normal after you are done with the juice diet, you are likely to regain some or all of the weight you had lost. We should add that you will only lose weight if you consume less calories than you normally do. So if you consume more calories in the juice, you will gain weight instead of losing it. Q: Should I consult a doctor before starting to juice? A: If you can, please do. Juicing is not for everyone. A good example is if you are suffering from diabetes or kidney disease; in this case you have to limit or monitor your intake of certain nutrients, which means adding certain fruits and vegetables to your diet would be unwise. For instance, melons and bananas are potassium-rich, and this is a mineral people with kidney disease are advised to avoid. As for diabetics, drinking the sugar-rich fruit juices will cause spikes in their blood sugar level, which is dangerous for them. Q: How should I prepare produce for juicing? A: Some fruits and vegetables need to be peeled and seeded first – these are the ones that have toxic skins or seeds. Peel the following: oranges, grapefruits, kiwi, and papaya. Seed the following: peaches, apples, plums, and all pitted fruits and vegetables. Apples – cut them to fit the feeder of your juicer. Since apple seeds contain a trace of arsenic in them, cut out the part of the apple that contains the seeds. Carrots – cut the ends off (top and tail). Fruits – bananas don’t have enough water content to be juiced. Wash and peel the fruits: watermelon, cantaloupe, peaches, oranges, strawberries, nectarines, and so forth. Most vegetables – wash them first. If the vegetables (for instance, cucumber) are waxed, peel them. Trim the edges of vegetables that have ratty ends (for instance, celery and beets). Rhubarb – use the stalks only, since the leaves are toxic. After testing various juicers, we ended up picking the Tribest GSE-500 as the best juicer. It guarantees a highly nutritious juice, easy cleaning, versatility, and a warranty of 12 years.